I feel like I should be writing this from an antique plush velvet lounge couch with a mink shawl draped luxuriously over my shoulders and a long cigarette holder from the 1920’s effortlessly dangling between my fingers, because people…I feel so stinkin’ cultured after this weekend. Just call me Holly Golightly. But before I get into that, just a quick announcement that is super exciting! I had been getting some feedback that the download process for my ebook, “My Blogging Tips” was a bit cumbersome. So — it is now available on iTunes! You can get your copy here. OK – back to my Breakfast at Tiffany’s. This weekend, my best friend and I went to The MET – The Metropolitan Museum of Art – in NYC. I’m going to be super honest with y’all. I live down in the village, and honestly, I never leave my little corner of Manhattan unless I absolutely have to. I just don’t want to deal with the tourists and the traffic. No thank you. But, this weekend, I decided to just say yes to every opportunity that came my way. And let me tell you…saying yes to the invitations literally led me all over the city. Brunch on the Upper East Side, seeing a Broadway musical, sunset on a rooftop bar in Midtown, a nightclub at 4am in Alphabet City, lunch in Harlem, chilling at a friend’s house in the Bronx, strolling through Central Park, and finally, spending the afternoon at The MET. It was, in a word, marvelous. And if you’re traveling to NYC, seriously, send me an email – I have so many fun suggestions of non-touristy places to go, and I’m not even joking. The only other time I had been there was when I took the fifth grade boy I nannied, so we literally were in and out after just 15 minutes of looking at the Egyptian mummy installation. The art was beautiful, obviously. There were impressionist paintings, and sculptures and textile art and different expressions of beauty and creativity. And I loved it. But one of my favorite things we saw there, were the different trinkets and every-day life objects that had been preserved from the Greek and Roman time. Decorative drinking bowls, and intricate pieces of jewelry. Fascinating tools they used for bathing or grooming or eating. These old little ornaments and articles told a story of what life was like, way back in time. They offered a glimpse into how people lived their lives, and allowed us to imagine what a day in the life must have been like. And it made me think…if someone were to capture my life, and put the trinkets and objects that were meaningful and important to me on display hundreds of years from now, what would they choose? What would they put in a glass case to preserve and display about how I lived my life? I kept thinking about that question as I was falling asleep that night, and it kinda kept me up a bit. I mean, how dismal would it be if an iPhone and a subway MetroCard were all I had to show for myself? And I invite you to take your own inventory – it is a bit eye opening, I’m not going to lie. What would be displayed about how you live? Because if you’re anything like me, I think what I would like to be displayed, and what actually would be displayed, are perhaps a bit different. I would like to be able to show that I was some fabulous, faith-filled, family-oriented, fashionista who spent her free time saving the whales and planting trees and solving world hunger. But really, am I living my life the way that I would want to be depicted? How am I spending my time? What captures my attention all day? Who do I talk to regularly? Because if I’m being honest, I can be guilty of devoting more time to reality TV than to worship. And that’s a problem. They say that actions speak louder than words. But I’d like to tweak that a bit and say that actions speak louder than intentions. I can intend all day until the cows come home, but when all is said and done, how I spend my time, how I treat people, how I speak, the media I allow in my home — those are a more accurate depiction of the person I am than simply my intent. So I better start living the way I say I want to live. Because life is short. And fragile. And there’s no time like right now to start living intentionally. Bible. Czech stickers from my mission time there. Seahawks hat. Mountain Dew. In that order. None of that, except the Word, will survive the end fire, of course. So I’m glad God is collecting fruits of mine that I have no idea about. Those lines really stood out to me too. Abba is really helping me to hone in on spending quality time with Him again and reminding me how spending time with Him ultimately leads to receiving the abundant life in Christ. Thank you for believing Jesus, my beautiful sister! I just hope my glass case doesn’t have a vacuum cleaner and dog hair! Wow! What a powerful post and timely, too. I believe that true contentment can be achieved when what you know and believe are aligned with how you live. Here’s to living the life we are meant to live now! And what a beautiful life you have created for yourself. I hope you continue to enjoy it and honor it. The Eucharist is so important I have discovered as a Episcopalian. Faith is important. Great post, very thought provoking. And I love New York! Hope I can go back some day. God bless! Yout posts always make me smile & funnily the word, or rather attempting to be more ‘intentional’ has been on my mind of late. Thank you for the nudge. Ps. Love the meme from Singing in the Rain, love it! Ah. Okay. I had to blow up the picture of Audrey it looked like you. So you finally saw it? I mean, maybe you didn’t. I don’t watch Native films because I just, look in the mirror. We had this conversation a while ago. If you did see it. It’s really good. My top 3. Breakfast At Tiffany’s. I agree with you. Action and rhetoric are two different things. That’s an interesting way to look at museum artifacts. It would be a good Halloween costume. I’d give you a Kit Kat or something if you knocked on my door. Hmmmm I think I just found my costume! 🙂 thanks! Woo. It just got hot in here. 🤓 About helping though. I come from a different time. I’ve spent most of my life in the service of others. Neat to start a dialogue about it. Interest in helping others somehow over self interest. ✨💛✨ I’d love to hear your thoughts about it! I had a strange life. I did remember everyone that helped me and tried to do the same for others that were like me. Lost kids. Sure, I didn’t get really far in life but I did a lot to make sure others were okay. I’ve done stuff with Special Olympics, Make A Wish, Red Cross, Salvation Army, small church drives, few museums, a few food banks. I, don’t know it really is more solid than donating when you’re there on the ground. Love, is not what’s missing. Love is what is left. We want to dance and sing and pretend life is great. Fall in, love. Love, is the bright eyes in a little child in a world of darkness. I know those eyes. I pickup kids like that and make life a little better. That’s love, giving when you think you can’t and finding anything better. A new soccer ball. Tag. Something. I hope you find what you’re looking for. I may have missed out on a lot but, I’ve helped. I’ve helped a lot. Not quite the intimacy of love but maybe that is not for me to have. I’ll email you a LinkedIn of a guy I’d like you to meet. Maybe he could help you with this. I just try to be respectful. Distant. Brooding. Haha. Kidding. Kind of. I like your writing voice. I can tell a difference from when you first started. It’s more confident. Passionate. Lucid. Like, probably how you would be in person. Tequila. I miss that stuff. I haven’t drank in years. Living near the border the tequila tastes, better. Hornitos is pretty good and Herradura is like a single malt. Slight vanilla but not annoying like a latte. Certain attitudes in the church can be polarizing. Creating an us versus them and a social hierarchy within believers. When I see that I, turn off. Tune out. Jesus was not like that. He didn’t blame the poor for being poor he lived with them. I live with them. I am them. That original context of helping others has been lost in the larger powerful churches. Jesus did mention that though, many will come in my name. The rich man will have a harder time getting to Heaven. It is not, retribution for mistreating a lower class I see it as a larger thought problem. God only gave us breath of life but did not give us the privilege to put down others. Although, some may disagree and call those blessings. we all are created in His image and are equal brothers and sisters in Christ. I was sketching in Oklahoma City. There’s a well known community Church. Some homeless spent the night under the trees and a church official tried to remove them. It’s a Saturday. I just spent the night on a park bench myself because a greyhound bus decided to skip Oklahoma City. The police came, arrested two homeless persons. The church official smiled and I walked away. We need to look at the ugly and inequality so we don’t keep doing it and calling ourselves, better somehow. Very thought-provoking. Thanks for sharing. Awesome BLOG. I’m glad you are happy — your positive energy and happiness definitely manifested themselves in this BLOG — a joy to read! Let’s meet up in LA. I’m working on a project down there. Oh man, I wish I lived in LA! An interesting perspective one thinks about more as they grow older. The trinkets you talk about are the people you leave behind after you have gone to rest for a while. What influence have you left with them that makes them into that spectacle, those sparkling jewels and gold objects to display the kind of traits Jesus modelled in His short ministry here on earth? I guess we can leave behind ruins that people dig up and try and interpret too. Stark relics that silently tell of destruction as time passes. It’s all about our choices now as you quite rightly point out. Well, I have to admit you stepped on my toes a bit with this one. I intend to do good, productive, creative, helpful things, but not sure I actually accomplish a great deal. I especially loved your tweak, “Actions speak louder than intentions.” I think I need to make little signs with that on them and put them around in every room until I learn to go beyond intentions. On another note, I noticed today that you liked one of my granddaughter’s posts on her blog, First Class Act. I guess that just proves something about great minds running together. 😉 And thanks for encouraging her. Thank you! This really spoke to me tonight. I had a chance to hear Dave Ramsey speak two weeks ago at a simulcast and he spoke about being the change you want. “You just *clap clap 👏 * make the change”. Thanks so much – those are great things 🙂 Oh nice! Yes clap clap make the change! Woo! As I read this I started taking inventory of what I have at home in the bedroom and office; clothes, jewelry, library, art work… What would stand out to someone who doesn’t know me? In my office, I would hope the bibles and the single shelf of Christian books; histories, biographies, and more. I think they’d notice my college ring. They would notice the gold pinkie ring, but they’d never know it was my father’s wedding band that I got after he died. There’s the blow up of the photo of Julie and me in front of Notre Dame and other framed pictures and prints of places we’ve been. Well, I’m on the road again this week, but we’re both doing well coming off vacation last week! So glad you had a great weekend! nice 🙂 yeah the post vacation glow 🙂 yeah! safe travels Jeff! Now I just realized I have a lot more writing to do. Better make hay while the sun is shining. Hi. You have a good point here. The trip to the Met reminds me of another blogger here on Word Press. But can you really go to all those places in New York in one day? You continue to dream, Girl. Your weekend seems to have been awesome. Thank you for sharing. What a beautiful post. How wonderful that you are living simply and joyfully. You have such a good recovery, so strong that you never mentioned your ed at all. I’m 44 and have had an eating disorder since I was 17. I’ve been hospitalised twice with anorexia and a dangerous bmi. Then I binge and put on loads of weight, then starve again. I did have 5 years of recovery, but I’ve been ill again for 3 years. Your posts are amazing and inspirational. I want that kind of recovery. Wishing you angels and peace. Be-U-tiful! <3 Loosing my baby girl has made me feel like I have wasted so much… life. Your title…caught my eye. It a God-incidence, a way reiterating what I need to do to fulfill my destiny. 👏🏻👏🏻👏🏻👏🏻👏🏻 I loved your post! Amen! Amen! Beautiful post! It has really got me thinking as to what items would depict me. Will be sure to hit you up for tips when we finally get to NY! My phone, my car, and my coffee cup…hmmm, while I do have some great coffee cups, we are drowning in clutter and clothes!!! Thank you for helping me to remember how important it is to clear away all kinds of clutter to make room for what we truly care about in the world. Now I will embark on sharing this knowledge with my three growing girls and see if we can lower my thrice daily laundry loads! Ha! Thank you for a wonderfully inspiring post! Since joining the Orthodox Church I have been given the opportunity to live life with more intention rather than just drifting through my spirituality as if it did not belong to me. I very much enjoy reading about the desert fathers and mothers. One in particular that had a deep effect on me was Elder Thaddeus’ book, Our Thoughts Determine Our Lives. It’s not that ‘name it and claim it’ stuff but rather an amazing concept of; What if I am the person who refuses to be offended? Who refuses to judge others? Who is determined to love their neighbor? Who prays? Who is merciful and loving? Of course it is not easy but it is so worth the effort. Even in trying we can change. Try not to beat yourself up too much. We must also love and be merciful to ourselves. 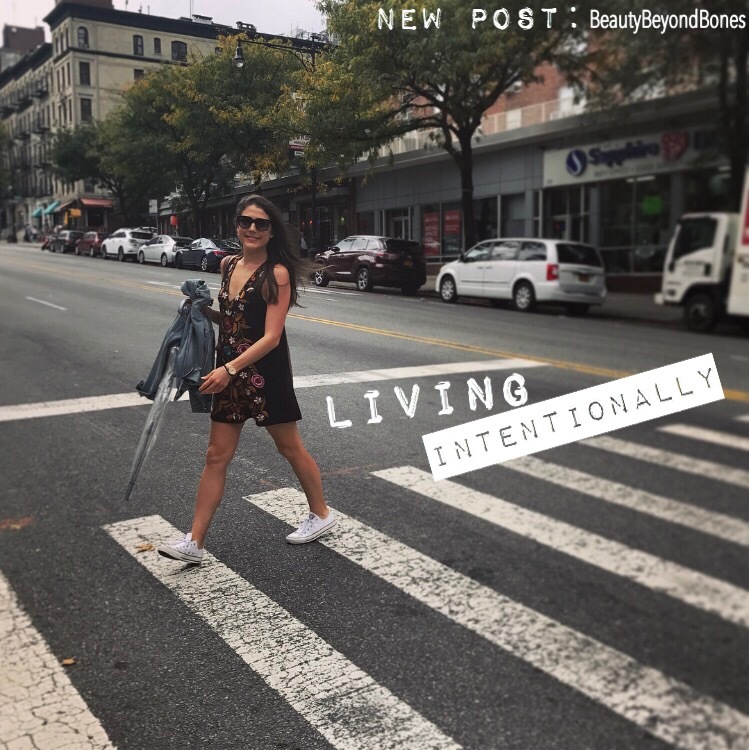 I like the title – Living Intentionally, but more importantly, I like the message here. The question about what would be left behind to represent me a hundred or more years from now is a good question. I would like to think it would show family, faith, theatre, activism, and passion for life. What would represent those things? My photos of family life, my favorite cross, a playbill from a play I directed, a memento from the women’s march, and some of my writings. Thanks for making us think. Loved it! 🙂 Knowing and walking the path are different. You are one remarkable lady. Thank you for writing, “Living Intentionally”. It seems like such a simple concept, yet so often one that is forgotten in life. Keep inspiring me and so many others. I really enjoyed reading this. Living the life, you want to be depicted has to be intentional in the actions you conduct—so true!. John Maxwell has a great book about intentional living. Glad you ventured out of your shell and said “Yes” to have such an awesome experience. You are so welcome. Your posts give light and inspiration. Life is beyondbeautiful! Thanks so much for your hugs & love! 🙂 I need that right now. For a change in scenery, you may want to try Williamsburg down in Brooklyn. Great bars & outdoor cafes. Parks too! Wow. That one kinda hits a little hard and close to home. Keep it up! This was great Caralyn. Guess we just need to get outside of our comfort zone sometimes and go explore the world around us. If we dare do this, then the results can be surprisingly eye opening and wonderfully positive. I could certainly relate to this article. I’m trying to break myself of so much screen time! I like this. The museum display is a great way to size up how we fill our days. Sadly, my cell phone was one of the first things that came to mind as well, it does do much, if used wisely, but you’d never know by looking at it from afar. I will definitely be spending a little time on this one!! Taking my life into inventory, is somewhat of a scary thought. And one that I am quite sure I won’t like the answers. Thanks for sharing this post!! Look forward to reading more!! I really like this way of thinking about whether we are living our best lives. And you write in such an entertaining way! Great post. Hi, what a great hectic life you lead in Manhattan, Fabulous! My lifestyle is much less active then that because of money and circumstances constraints, however, instead of going to the ‘chippy’ or chip shop in England where I live, I went to supermarket and brought some plain flour, Macdougals mind you, I’ve got eggs in and fresh milk, made the batter which I’ve been meaning to do for the last three years! then fried a couple of fish for me and my brother I care for. Great! with some salt, vinegar and a bit of ‘jiffy’ (had no fresh) lemon. Hey, not to bad! I have settled down in my new Jesus Christ Church of Latter Day Saints, and relatively speaking life for me is pretty hectic! in the church sense. Always a pleasure to read your blog, have a great week! Jesus loves you! “They say that actions speak louder than words. But I’d like to tweak that a bit and say that actions speak louder than intentions.” So powerful! Love it! I did appreciate the message of your post; however, I loved the parts about going all over NYC. I wish I could visit the Big Apple soon and get your “places to go” list! You hit the nail on the head with this one! I often find myself wasting hours away, instead of doing things that would glorify God and His kingdom. Definitely something that I want to work on as well! Beautiful post. You got me at NYC. New York is one of my favourite cities to visit, it’s so vibrant and exciting with lots to discover. I thoroughly enjoyed reading your post and found it very profound and insightful. I love all the different graphics and the one that really hit me smack in the face is “The words you speak become the house you live in”. I will try to remember that phrase when I’m being negative about myself . I can also relate to doing other things as opposed to spending time with God or doing the things that would create the life that I want. Lots to think about. What great insight and wonderful analogy! This has been on my mind as well. We, especially as Christians, have to live out our faith, and let our walk with God be evident in our lives. Thanks for this motivation and message! Very nice. Amen to being intentional. I need to have a weekend like that! haha sounds amazing! Excellent post and realization for yourself and anyone else, how we must “choose” daily what we intake and how the world will perceive us. You also hit on what “legacy” do you want to leave behind? You may enjoy John Maxwell’s book “Intentional Living”. Excellent read and great for small group book study! Reblogged this on Words of a B Student. I am just getting around to reading this post…it hit me right where it counts! Thank you so much for sharing this insight and soul-searching questions.